Vellamo came with 8 group 31 wet cell batteries. It hasn’t had a battery charger hooked up for 3 years… so naturally all the batteries are dead. I figured instead of writing off all of the batteries, I’d take a $100 gamble and buy a pulse charger that’s supposed to desulfate and resuscitate dead batteries. It’s an Optimate 6 by Tecmate. I didn’t expect it would bring the batteries back with much capacity, if at all… but it actually works. 2 of the batteries are taking and keeping a decent charge (I estimate I’m getting about 80ah out of each now). 4 of the batteries are too far gone, and it’s working on the other two right now. It takes days for this charger to bring back a single battery, so in the mean time I need to have dc power. I turned on the battery charger, and the dc switches, and let the charger run things. The battery banks showed a good charging voltage, but as soon as I turn the charger off, they drop away. During this, I kept my eyes on the batteries, and one started to boil off. I pulled all the cables off it, and part of the case had actually melted. Very scary. 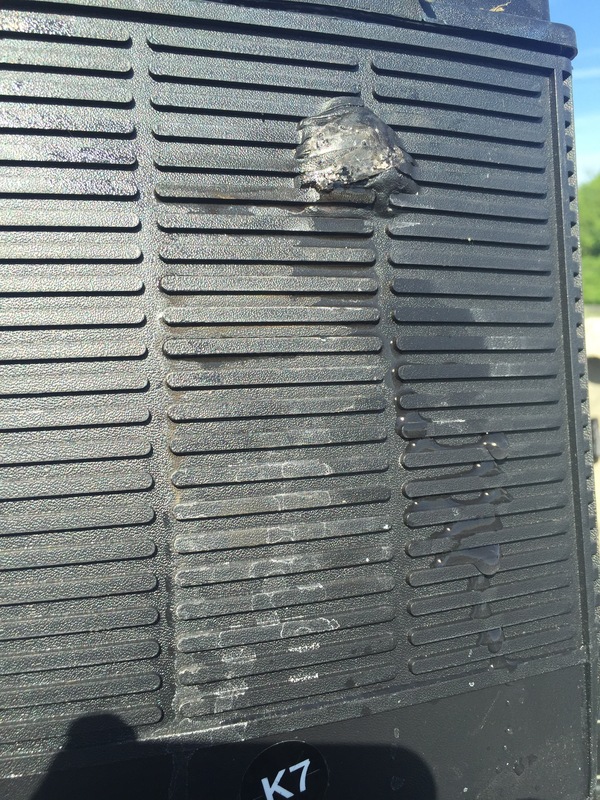 I’m not sure if it’s the boat wiring that caused this, or and internal issue of the battery. 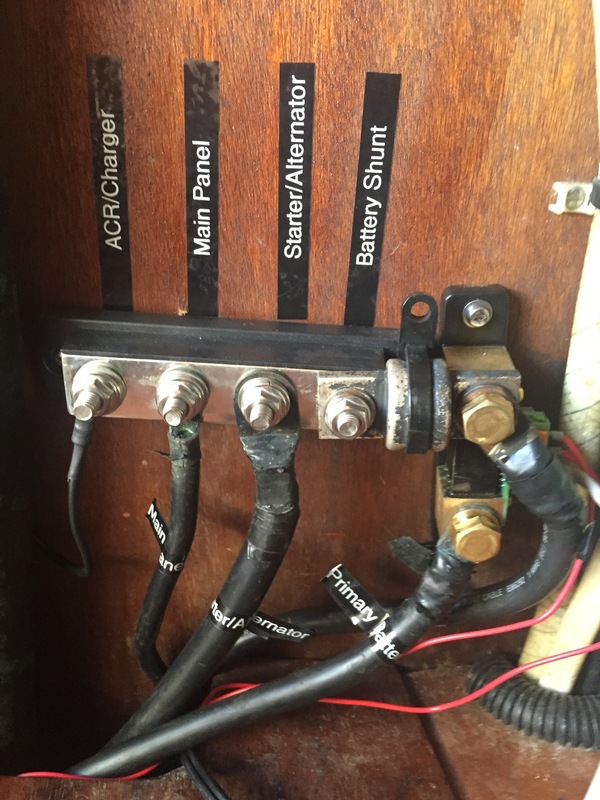 Regardless, that battery is off the boat, and it moved my rewiring project further up. I decided to rewire all the big gauge stuff, because I don’t really know what was going on with it. The greatest tool I have bought for electrical work is a label maker! Wires seem obvious when you’re putting them in, but come back in 6 months, and you won’t remember what went where. Or if you need to figure something out in a hurry, or if you need to pay someone to work on things, you’ll be much better off having things labeled. I try to label every wire on both ends, if I have to bundle it somewhere, and everywhere it travels thru a locker or such. Not everything is labeled yet. 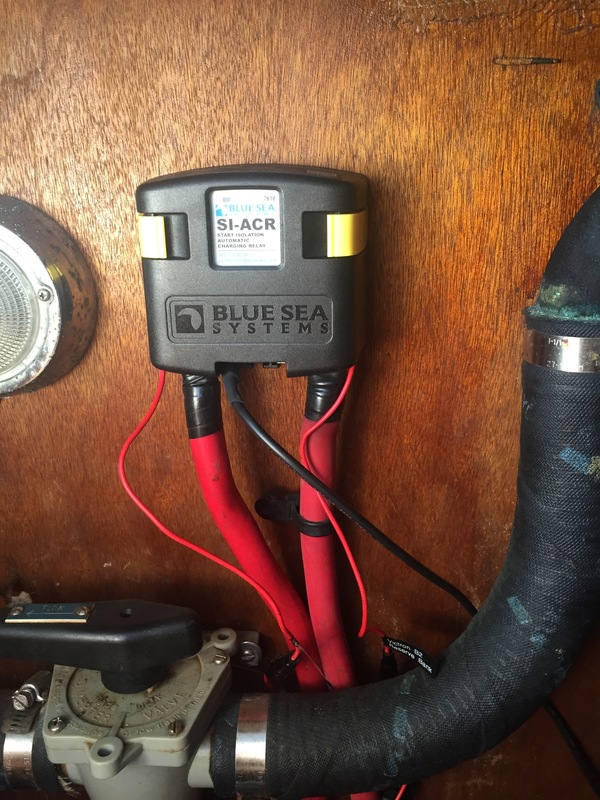 I installed a Blusea ACR, a Victron 702 battery monitor and fuses on the battery posts. While obviously not completely necessary, these items give me the confidence in my main power system that I can relax and not worry about it. I have to give credit to Compass Marine for a lot of the guidance. That website is an incredible resource. There are a few things left to do, I’d like to run my alternator directly to the battery bank, along with the battery charger, but I’m happy now with where things are at.